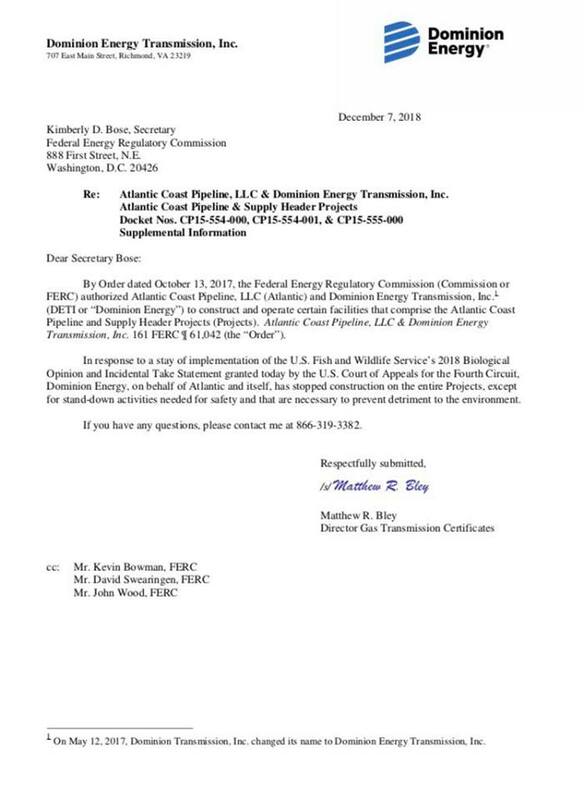 How’s this for a Friday night news dump: Dominion Energy has suspended ALL WORK along the 600 mile route of the Atlantic Coast Pipeline. In its decision hours earlier, the Fourth Circuit granted an emergency stay motion filed only days ago by the Sierra Club and other environmental groups against the Atlantic Coast Pipeline. In its order, the Court issued an immediate stay of the Fish and Wildlife Service 2018 Biological Opinion and Incidental Take Statement, which apparently means that all construction must stop – along the entire 600 mile route through West Virginia, Virginia and North Carolina. That’s Dominion talk for admitting a huge loss. Whatever happens next, this work stoppage further delays and complicates Dominion Energy’s rush to get its massive $7 billion pipeline – to be paid for by unsuspecting ratepayers – approved and built before the opposition – and the courts are able to stop it. The stunning work stoppage news caps off a huge news day in the pipeline battle in Virginia. As readers of Blue Virginia know, the broad movement of committed social and environmental justice advocates that comprise the Virginia pipeline resistance has been winning battles on a weekly and sometimes daily basis. In the courts. In the streets. In the trees. In the court of public opinion. Fairfax declined to say whether he supported Gov. Ralph Northam’s controversial recent decision to remove two members from the state air pollution board less than a week after they expressed concerns about a plan for a natural gas compressor station in Buckingham County. He said he had met with people from the area to hear their concerns and shared the concerns with the Northam administration. “The governor made his decision,” Fairfax said. Some have noted that as Lieutenant Governor, Fairfax has no control over what happens with Union Hill. Perhaps. But he certainly has no control over the NFL either. That did not prevent him from expressing his “grave concerns” about how the NFL has responded to the protests by Kaepernick and other players. He has a voice. And he should raise that voice for the good people of Union Hill. Several hours later, news broke that Attorney General Mark Herring had filed suit against Mountain Valley Pipeline, citing more than 300 violations of Virginia environmental regulations. Many pointed out that this lawsuit to collect “maximum civil penalties” is weak tea and a poor substitute for a stop work order, which is authorized by Virginia law. And they are correct. But it is some progress. Meanwhile, the NAACP held a town hall last night on Union Hill, a protest in Richmond is scheduled for 4 pm on December 7, and the Air Board is meeting on December 10. Or is it. As the afternoon wore on, DEQ announced that the Air Board meeting has been delayed from 10 am on December 10, to 12 noon. And it may not happen at all, depending on the weather. Or so they say. And then the Friday news dump of an immediate stop of all work on the Atlantic Coast Pipeline. When all is said and done, all of these stories have one thing in common. The pipeline resistance movement in Virginia is having a huge impact. The courts are acting. Our story has gone national. Mark Herring has been forced to at least start some long overdue enforcement action. Justin Fairfax has been forced to go on record, however weakly, after months of relentless pressure. And Dominion and DEQ are worried about what happens next.